Eddie Brock as Venom is one hell of a Spidey foe, and despite never getting a decent big screen adaptation, sure has a pretty impressive fanbase, myself included. 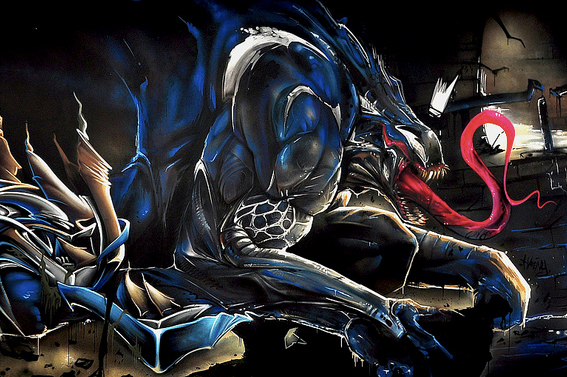 Swap Australia for Hamont, Belgium though and you'll find the lethal protector not only menacing his way through Spider-Man comics, but also on the local graffiti art scene, as captured by Flickr user By Startape Photographe. Now that redefines mean. For more great shots including the entire wall, visit Startape's gallery after the jump. Nice art. A bit on the cartoon-ish side, so this would translate better for an animated show, but still nice. Venom animated Dale - now you're talking! Still this is pretty sweet, and a damn sight better then a lot of what unskilled street artists are passing off as art around this place. Indeed! Plus who wouldn't have wanted(and might still) want to see a Venom animated show during the Separation Anxiety years? Mix in Carnage and all those characters w/ a guest spot by Spidey, and you have an instant classic. now theres an idea worth selling.